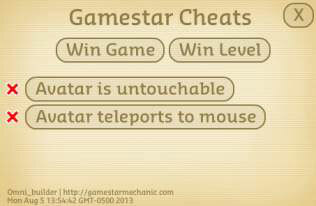 If you’re a teacher, you can use special cheats to complete any Gamestar Mechanic game more easily. Then you can completely analyze students’ games, whether or not you’re able to complete them on your own. Some students create difficult games, and draft submissions are often unbeatable, so cheats are useful for seeing the full expanse of the game and being able to give complete reviews to students. If you complete a game but you used a cheat at some point during the game, the site doesn’t count it as a victory in the game statistics. If you’re playing a game, you can access cheats at any time by pausing the game and clicking the Cheat button. A menu opens with several options for manipulating the game. Win Game: Immediately opens the You Win page at the end of the game. Win Level: Automatically clears all level goals, displays the Level Complete screen, and advances you to the next level. Avatar Is Untouchable: Puts your avatar in a constant “hurt” state, effectively making it invincible. After taking damage, your avatar normally flashes red and cannot be damaged for a short time, ensuring that enemies damage you only once with a brief collision. Your avatar becomes immune to health damage — however, you can still lose the game if a VIP sprite is fragged or if you run out of time or energy. Click the button for this cheat a second time to turn it off. Avatar Teleports to Mouse: If you activate this cheat and return to the game, you can click anywhere on the game screen and cause your avatar to instantly move there. If you teleport the avatar into a wall, the avatar is pushed into the first empty space it finds. This cheat is especially useful for navigating games quickly and seeing everything that the designer has composed.